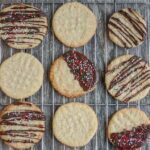 These Almond Flour Butter Cookies are made with just five simple ingredients and are so easy to make! The gluten-free recipe makes one dozen cookies – the perfect addition to your holiday cookie trays! In a mixing bowl, beat softened butter, brown sugar and vanilla using an electric mixer for one minute. Add almond flour, baking powder and salt and mix just until a dough forms. Use a Tablespoon to scoop and roll 12 balls and place on a baking tray. Flatten each ball using the tines of a fork to make a criss-cross pattern. Bake at 350 degrees F for 9-10 minutes. Let sit for 5 minutes on baking tray before transferring to a cooling rack. Let cool completely, then drizzle with melted chocolate chips and sprinkles if desired.